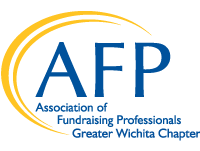 To help individuals serving not-for-profit organizations develop their knowledge and skill in fundraising, the AFP Foundation for Philanthropy and the Greater Wichita Chapter sponsor an annual Chamberlain Scholarship to attend the AFP International Conference on Fundraising each spring. Through AFP International, the Greater Wichita AFP Chapter offers one Chamberlain Scholarship covering the cost of conference registration (approximately a $595 value) PLUS another $1250 (in 2018) to help cover travel and lodging costs as a one-time award to a deserving individual, who has not attended a previous AFP International Conference. Note that Chamberlain Scholars are responsible for a $10 payment to secure the registration. The application process for 2018 is now closed. Check back in September 2019!